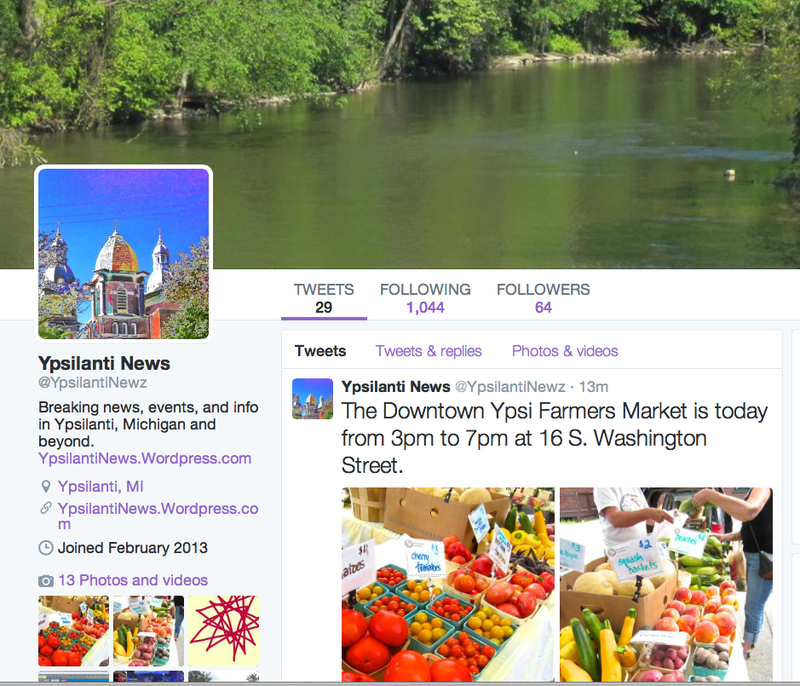 Since most local news sources have been SILENT on the International Village scandal, YpsilantiNews has committed to resume coverage. You have to ask, however, WHY so many news agencies have remained QUIET. The only answer that comes to mind is that they are all hooked up with the big money players that are trying to push this development through…. Many thanks to Tom Perkins at Metro Times, Mark Maynard, DamnArbor and Michigan Radio who have kept the public informed very honestly thus far! Concentrate and MLive wrote articles because they were obligated to write articles and look involved. MLive’s article was specifically slanted pro-IV which is no surprise. 2. Let’s start with the stalling of the China Trip I: What happened? INTRODUCTION: A large concern right now with the International Village development is that our City Council is supposed to be investigating the illegal CHINA TRIP taken by 4 of our city officials, but the investigation has strangely stalled. Even more concerning is that, despite many City Council members expressing serious concerns about this project, the City Officials continue to meet behind closed doors with the unethical developers! Furthermore, independent research and investigation into the developers and their background has brought many more concerns to light. There is lack of experience, lack of information, lack of credentials, and a high potential of fraud with EB-5 developers as well. What’s really going on? 10/3/17: City Council voted to hire an outside investigator to look into the unethical China Trip taken by Mayor Edmonds, Mayor Pro-Tem Brown, Police Chief DeGuisti, and City Economic Developer Ernat. This decision was based on a lot of evidence showing that the developer paid for the trip, which, according to City Attorney John Barr, would be unethical and illegal. City Council requested all email and travel documents from the 4 travellers as well as from City Manager McClary as part of the investigation. 10/7/17: The documents were turned into City Council and are available here. There are many serious concerns that arose from these documents, such as clear evidence that Mayor Edmonds received a message BEFORE the trip stating that the developer paid for it. Beth Ernat seems to have altered at least one document. There is a lot of information missing, like everything about the Shanghai part of the trip and more. Mark has blogged about this issue at least four times and has done a great job summarizing this COMPLEX issue, and, as always, has not been afraid to state the obvious truth. 10/17/17: City Council met at their regular time. They were supposed to decide on an outside investigator to lead the investigation into the unethical China Trip. This did not happen! You can view the video of the meeting here. Our City Council has been divided and gridlocked and generally ineffective for years now, and thus they did not come to any agreement about the China Trip Investigation so NOTHING IS HAPPENING NOW!? There seems to be rivalry between several members of our City Council. This does not create an effective team to lead our City. Nothing gets done because they can’t agree. We need a new City Council. There has been no update from her since then. Not even to tell the public that City Officials just had at least one recent meeting with the alleged developers and seem to be moving forward! (see details below). HEY PETE, WHY DID YOU VOTE DOWN A RESOLUTION TO HIRE PLATO LAW TO INVESTIGATE THE CHINA TRIP? After much discussion and several proposals that did not reach the required four votes necessary, including one offered by me and supported by Councilmembers Robb and Vogt to subpoena the bank records of the Chinese Student and Scholar Association, Amy Xue Foster and her corporation Global Capital Group, LLC as well as records of the travel agency, Young’s Travel. The key issue in this affair is who paid for the trip and those records would directly address that issue. I believed that those documents would shed additional light on that question added to the already existing evidence on the record. It would have been a speedier and less expensive than the outside legal firm. WHAT IS YOUR POSITION ON INTERNATIONAL VILLAGE? With all the scandal, including the developer Amy Xue Foster lying to us about where the money came from, why are our City Council members still considering this deal? Something is very fishy here! Last week we were informed that the development team was lacking a developer and was seeking to fill that void. We also were advised that it was highly unlikely that the deadline of December 31 to complete a development agreement would be met. A mutually agreeable extension would have to be negotiated and approved by City Council to proceed beyond that time. City Council being frustrated with the lack of information flow and openness of a flawed process passed a resolution (below) that directed that staff provide weekly written reports, Status presentations at each City Council meeting, a public hearing and discussion of the Development Agreement at a meeting that no vote would be taken, a public hearing and discussion of the granting of any Brownfield or other City incentive at a meeting that no vote would be taken and a full review of the background and experience of the International Village team as well as status of the investments and investors. What does this mean? It sounds good, but Council now has a track record of not following through on what they resolve to do, so does this new resolution mean anything? It’s great that they are showing concern, but this deal needs to be ended and they are making plans to go forward! City Council, you are ignoring the citizens of Ypsi and going forward with the purchase agreement. This is unprofessional and disrespectful. End this deal now! Are City Officials at odds with City Council and there is more infighting than we realize? Is City Council unable to communicate well amongst themselves and with the City Manager and Economic Developer? Why aren’t ALL meetings with the development team open to the public? Why are City Officials (that are under investigation!) even meeting with the developers after they have been untruthful and have no background in developments this large? Council and City Officials have failed to research this project and the development team. Our City Council members only make a few thousand dollars per YEAR. This is essentially a volunteer position. Why are we allowing unqualified volunteers to make HUGE decisions for our city?? This is truly ludicrous. If there is no developer and the project needs to be postponed (cancelled! ), when is this happening? The citizens demand a permanent halting of this project NOW! Our Sustainability Commission recently recommended to postpone this development, and you can read below how this item was removed from the City Council agenda! Development department staff met to discuss research necessary for creation of Community Benefits Ordinance. Staff from Finance, Economic Development, Police, Fire, and Assessing met to discuss a request for analysis of the International Village project. In order to provide key analysis and financial figures all departments need more information. The information specifically lacking at this point, is number of units, number of bedrooms, cost of infrastructure, cost of building, number of stories for each building, and hard construction costs. As the plan is only in a conceptual phase and no public working sessions for design have been completed, true costs are impossible to project. However, an important fact was cleared up by Assessing, new taxable value does not impact the Headlee roll-back calculations. The City Manager and Economic Development staff met with three leaders of the International Village Advisory, LLC, Amy, Hal and Bob. We discussed the public process going forward, the need to identify and add to the development team, the need to begin the public participation process with design charrettes, and the EB-5 regional center. Two key people have been identified by IV for discussion on the Regional Center. Representatives can be available for a work session on October 30th or November 13th. We will need to select a time for the presentation as soon as possible. Why are our City Officials that are under investigation meeting with developers that have very uncertain pasts with little credentials? Why is any of our City Staff meeting with developers that have directly lied to them/switched up info/refused to follow our ethics? Has any member of City Council met with or talked to the developers recently? Why is our city condoning and endorsing a Visa For Sale program that marginalizes most refugees and goes directly against our ethics as a Sanctuary City? OUR CITY OFFICIALS AND STAFF HAVE NOT BEEN TRANSPARENT WITH THE PEOPLE! Open these unethical meetings to the public! Open all correspondence made by our City Officials and International Village reps to the public! And what does this statement below from Beth Ernat’s weekly summary above mean? What Regional Center is Beth referring to here? Is the work session going to be open to the public? 3. Now, let’s look at how unethical the Purchase Agreement vote was and how it is NOT A VALID VOTE. Also, most City Council members seem are not informed enough to be entering into any agreement at all. Many Ypsilantians were very concerned when both Ward 3 City Council Members ABSTAINED from the Purchase Agreement vote on 9/19. You can see the video here (it is in 2 parts). The developers threatened our City Council in that 9/19 meeting, saying that if they did not vote YES on the purchase agreement right then and there, they were backing out! Essentially, they bullied council into voting ‘yes’. 9/19/17: Ward 3 City Council Member Brian Robb accused the developers of pulling a “Bait and switch” since they were presenting information very different about tax credits and brownfield credits than they originally had. Why didn’t Brian Robb vote ‘NO’ on the Purchase Agreement if his concerns were so grave? Councilmember Robb voiced his thoughts at a later town hall meeting, stating that capitalism is generally corrupt, and this is just a fact. He called Lois Richardson and others ‘naive‘ to think that developers should be honest. Council members who “abstained” from this vote knew there were enough ‘yes’ votes to pass the agreement, so they chose a safer route and remained apparently NEUTRAL, so they could appeal to voters on both sides of the argument. Based on what Pete says below (10/19/17), he should have been BRAVE ENOUGH to vote “no” on this agreement. Also, the Mayor and Mayor Pro-Tem had a trip to China riding on their votes, so their votes were a CONFLICT OF INTEREST and done under DURESS. Their votes should be thrown out. The only City Council member brave enough to vote “No” on the Purchase Agreement was Lois Richardson! Thanks for truly caring about the people, Lois! “WHY DID YOU ABSTAIN FROM VOTING ON THE PURCHASE AGREEMENT ON SEPTEMBER 19? Here is my post following that meeting. Why would our City Council allow this purchase agreement to move forward when there is so much confusion and when terms previously agreed upon had been switched at the last minute? Multiple questions were asked by citizens and City Council and neither the developers nor Council had the answers! Why is our City Council selling out our City out from under its citizens?? Are they “mesmerized by the pretty pictures”? Our City Council does not have the time or the experience to do due diligence researching all aspects of this program. Our Economic Developer and City Manager are also obviously not qualified/skilled enough to do this either. 4. Finally, let’s take a look at what is happening in some of our various City Commissions. These are groups made up of Ypsilantians appointed by Council. These groups advise City Council on a variety of issues important to our City and make decisions about the future of our City. Doesn’t it seem shockingly coincidental that items related to International Village keep disappearing from the City Council agenda? No, its not just coincidence. It’s sabotage. Who is the culprit this time? 10/18/17: Our Planning Commission had its regular meeting with an important topic on the agenda: affordability and accessibility of housing! This meeting was spectacular. If this Commission was running our City in place of City Council, it would be a much healthier and safer place for all! This commission wants Ypsi to adhere to the Master Plan, which states that everyone, no matter their age or income, can find a home in Ypsilanti. An excellent discussion of problems securing housing in Ypsi ensued at this meeting. This commission encouraged audience participation and asked questions to the citizens, engaging in a dialogue with the community members who attended. The Commissioners shared a lot of the audience’s concerns and made a resolution to form a Citizens Advisory Committee on Affordability and Accessibility. Contact them somehow if you want to participate. (Currently our Commissioners do not have an email address with the City, but they are working to fix this. SOON, I hope). 10/23/17: In the City of Ypsilanti Human Relations Commission (HRC) meeting, the Commission Chair John Shuler wrongly accused other members of the HRC of misleading the public when speaking about International Village at town hall and City Council meetings. Strangely, Chair Shuler wasn’t at these meetings and hadn’t seemed to have watched the video recordings of the meetings either. He seemed to be basing his concern solely on gossip he had heard in the community! This is extremely unprofessional and unproductive. He went on, trying to silence members of the HRC in future public forums, stating that they shouldn’t be sharing opinions in public if they say that they are on the HRC. However, none of the HRC members that spoke publicly said they were speaking for the HRC. It was very clear that they weren’t representing every member of the HRC. Chair Shuler held this conversation up for an hour, despite all other members of the HRC asking repeatedly to move on, It was clear Mr. Shuler had some sort of personal agenda and lacked skills to facilitate the conversation. In a shocking turn of events at the end of the HRC meeting, Vice Chair Sam Jones-Darling initiated a motion to vacate John Shuler from the Chair position. The motion passed with 4 voting yes and 2 abstaining. Thus, John Shuler is no longer the Chair of the Human Relations Commission. In the interim, the Vice Chair will act as chair and the commission will vote in a new Chair. John Shuler is still on the commission, but will no longer be able to guide the meetings for his own subjective purposes! The HRC also resolved at the 10/23/17 meeting to schedule a joint meeting with both the Planning Commission and the Human Relations Commission to discuss affordable housing and other issues. There is discussion of creating a Steering Committee, formed of the Chair and Vice Chairs of all three commissions. 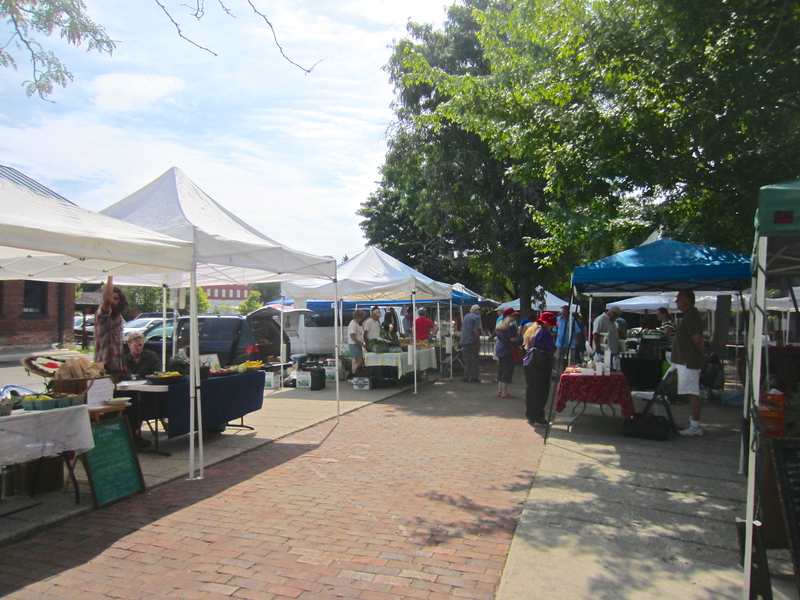 Many citizens did not know that Ypsilanti has all of these commissions! They are a great way for the community to get involved in running our City. Hopefully this debacle of International Village will teach our City that they need to be completely transparent to the citizens of Ypsi! Getting the Commissioners email addresses so that the public can contact them is an important step towards transparency. Why hasn’t this been done already?? CONCLUSIONS: City Council needs to end the purchase agreement now and stop this development completely. City Council needs to impose sanctions on City Officials who violated the City Code of Ethics. Some of these officials are doing such a poor job that they clearly need to be removed from their positions. Frankly, most of the people running our City are not doing due diligence nor are they listening to the people of Ypsi. Do we need a complete overhaul of our government? Do we need to start paying our City Council and Mayor living salaries so they have TIME to do their job? CREDITS and RFPs: Many thanks to the work that Tom Perkins has done at the Metro Times covering this scandal. *He is technically a food writer there, so he isn’t able to write as regularly as Ypsi needs. We wish we could give Tom a free groovy tiny house and an annual salary so he could just live here and cover our news. He deserves many Pulitzer Prizes for the controversial content he brings to light. Tom is for the people, not the money. If everything goes as planned, Tom, we want to have a tiny house for you and every Ypsilantian in the near future. You can read Tom’s articles on #WaterStreetGate from 10/11 here, from 10/7 here, from 10/6 here and 10/5 here. See the article about the China Trip Investigation here, and the beginning of the confusion about the funding here. There are at least 2 more articles and you can find them on this comprehensive IV list here. We are hoping that Mark Maynard will give us his take on the latest developments in this scandal soon as well. Michigan Radio has been helpful in getting the word out, but usually only comes to big City Council Meetings (and we didn’t see them at the last one). MLive finally covered this issue ONCE just a couple weeks ago, and they CLEARLY took a pro-IV stance, which is not surprising since they are on the side of MONEY, not the people. Many thanks to Defend Affordable Ypsi and all of the many Ypsilantians that have spoken up about this ill-fated proposed development! One great thing about all of this is that it has really brought us together and started the REAL Revolution. Thanks for caring about our City enough to read this whole article. Please comment below. What do you make of this disaster, lack of transparency, ethics violations, and complete confusion? 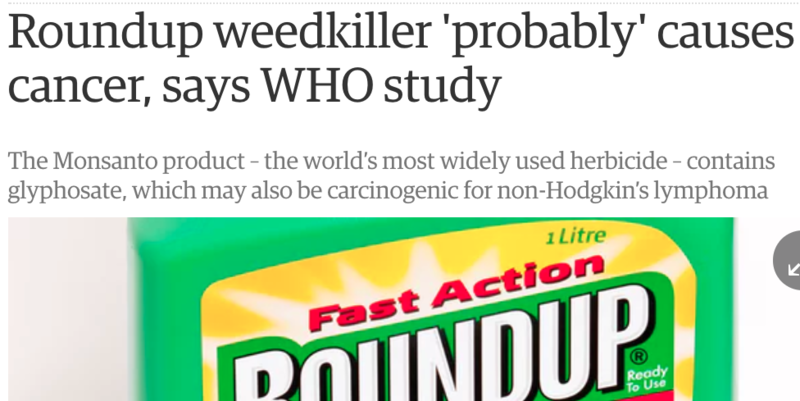 In 2015, the World Health Organization came out and said that glyphosate (a very popular herbicide sprayed on our food) PROBABLY CAUSES CANCER. Cancer has touched the lives of most Americans, either personally or having a loved one suffer from it. Everyone is ‘FIGHTING CANCER’ with pink or teal ribbons, running marathons, doing fund raisers, etc. No one has a campaign to avoid one of the main CAUSES of cancer though: OUR FOOD. How can Americans be so upset about cancer but REFUSE TO ADDRESS ONE OF THE MAIN CAUSES? Oh, yeah, we are ADDICTED TO GARBAGE FOOD. We are addicted to eating out. Few people take the time (or HAVE the time) to prepare their own food from organic, unsprayed ingredients. 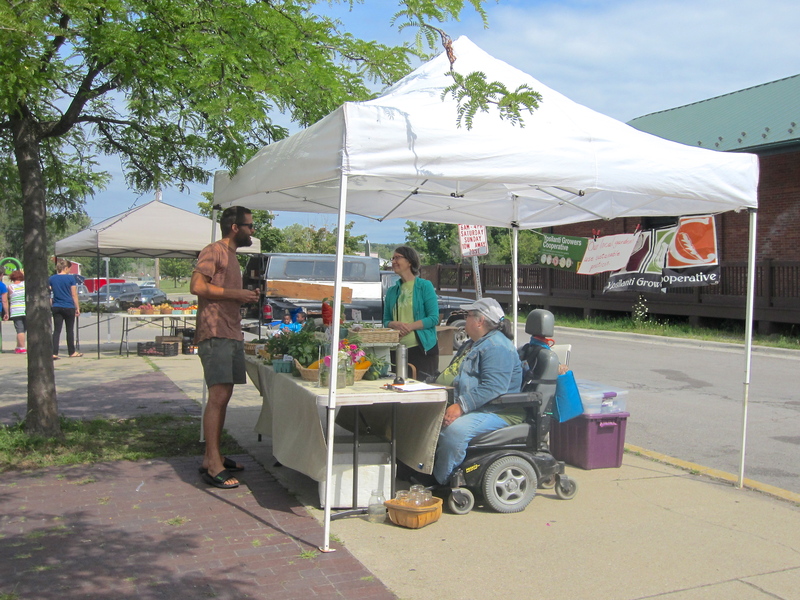 Even if you shop at the Farmers Market here in Ypsi (or anywhere), MOST OF THE FOOD THERE HAS BEEN SPRAYED WITH TOXIC CHEMICALS. You have to interview the farmer and ask about their practices to find out of they are spraying life-killing chemicals on your food! Some safe local farms are: Nightshade Farms Industries, Radicle Roots Community Farm, anything grown at Tilian Farms, Old City Acres, Zilke Vegetable Farm, and Farmer Bruce. There are some local farms that use organic growing practices but still use chemically treated seeds, which is a serious health problem still. Many local farms spray glyphosate and other chemicals on their food. And then you buy it and cook it. Do you eat out? EVERY RESTAURANT IN YPSI SERVES FOOD SPRAYED WITH TOXIC CHEMICALS! There is no restaurant that is free from poison yet. Some local restaurants are WORKING to make this better by buying from local organic farms and buying organic food. 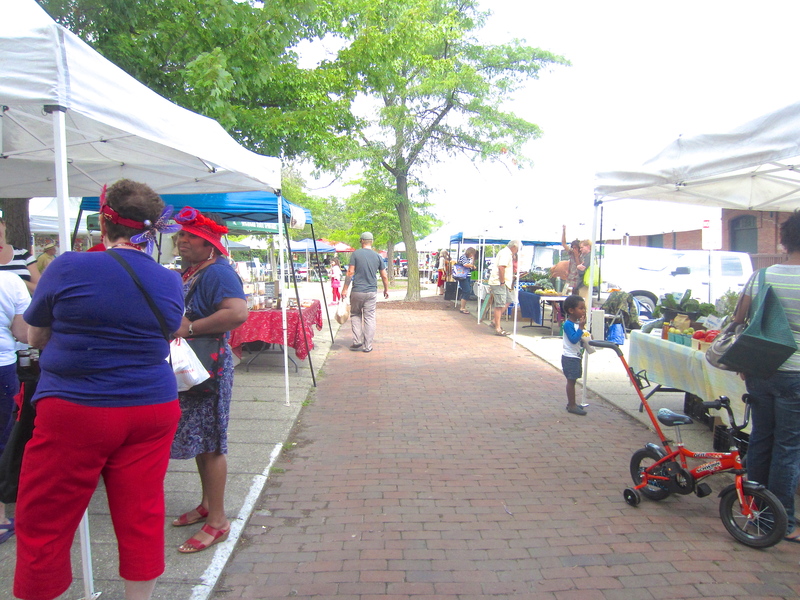 Leading the pack is Ollie, Ypsi Food Coop Deli, Beezy’s, and Bona Sera. Maiz is known to buy produce from Zilke Vegetable Farm, which uses organic growing practices. So, if you have to eat out, go to one of these establishments and ASK FOR ORGANIC FOOD. It really will make a HUGE difference in your health IMMEDIATELY. If you don’t switch to organic food, you really need to ask yourself WHY. What are you telling yourself that is allowing you to eat food that probably causes cancer? Maybe this food doesn’t allow us to think clearly? After all, it is sprayed with life-killing chemicals. How could your thoughts be in tip-top shape when you ingest POISON on a regular basis? Did you know the chemicals in our food are BANNED in many other countries? Food colorings that are commonly put in our food and the food marketed to our children have been linked to cancer and ADHD and much more? Why are you complacently allowing our FDA to poison us? Its not their fault. They are run by money. It is our fault for not being able to discern the truth in our confused busy world. WAKE UP, AMERICA! It is time to do an ORGANIC FOOD CHALLENGE. Here is an article about a family that went organic just for a few weeks and had AMAZING results. Here is a short video about it too. So what are you going to do, Ypsilantian? Are you going to keep eating food that causes cancer and illness? Or are you going to take the organic pledge? YOUR HEALTH AND THE HEALTH OF YOUR FAMILY DEPENDS ON IT! Hundreds of Ypsilantians have shared their concerns with City Council about the unethical International Village project. WHY AREN’T OUR COUNCIL MEMBERS LISTENING TO THE PEOPLE? “I am still, and will remain confused at supposed progressives’ insistence that installing what could end up being 1/8th of the population in this way has such shining potential for Ypsilanti. The shifting of class dynamics alone is alarming and has remained unaddressed despite being the most consistent criticism. The fact(s) that this is coming down through a morally bankrupt incentive program, at the same time our city is being rapidly affected by a neighbor with a development problem, with an unvetted development team that now we know lacks a developer, and continues to bring scandal through new and wiley illegal affairs ALL ASIDE, this was and has seemed a bad deal for ypsi since the beginning. Above, Pete Murdock says there isn’t enough specific information to be yes or no on IV, but then reiterates that he is not against the project, and sees such potential in it. I want to point out that continuously holding and defending a neutral position toward something as it accrues increasingly negative attributes and presents conflicts to your political and ethical alignment, is in fact a position in favor of that thing. If you are truly neutral on something, then as it continues to present or reveal negative traits you concordantly gain a negative view of it. You don’t hold out for positive traits to appear, as if from nowhere, while tirelessly defending it. “Pete, what are you waiting for to take a definitive stance on IV? As you see this development is corrosive to good relations within the city and between the public and the council. Do you think that these relations will improve once the development goes forward? No. The development will continue to be corrosive to the social fabric of Ypsilanti. Growing the City by 1/8 of its population is violent and unsustainable. There have been numerous red flags from the beginning and the Mayor and staff’s ideological and professional blinders make them ill-equipped to discern the wishes of the community. The mayor and staff lack basic cultural competency for dealing with working class communities. This is public land, and selling public land without community buy-in is a bad look. You will continue to waste the time and energy of all of us if you continue to aid the furtherance of this development. Ill will between different segments of the community will snowball and the council will continue to lose its legitimacy in the eyes of the public. Again, just because staff, folks at regional universities, the MEDC, people with interests in the American Center for Mobility think that IV is a good idea, remember that you are ultimately accountable to the people. This grow-the-pie mentality is corrosive to communities and the model of governance advocated by prevailing institutions, the Snyder administration, and the Mayor and Staff needs to be supplanted. If people at EMU support this development, please remember the experiment that was the EAA that was foisted on us by the Snyder administration. Are you going to be a willing pawn in the Snyder administration’s efforts to court Chinese capital and promote the EB-5 program? Ypsilanti is not a laboratory for corporate interests, corporatized universities, and the industries they bolster. Take a firm stance on IV now or lose your credibility as a progressive. The city had been played by this so-called “developer” and for you to think that something good can come of this makes you look like a fool. The system is fundamentally broken and people whose solutions only operate within the framework of business as usual are not helping. There are people with visionary solutions in this community. The creativity of the people of Ypsilanti is an asset, and by supporting IV you are selling out the people and their hopes and dreams and visions. WHAT IS YOUR OPINION ON THIS COMPLEX AND CRITICAL ISSUE? Are you having a hard time keeping up on the developments? That’s likely because it is such a complicated disaster, no one can keep it straight, even our City Council Members! They don’t even agree on who paid for the trip to China still…..
Facebook page FREE YPSI has a document in their ‘Notes’ section with all the latest articles and info on #WaterStreetGate HERE. Defend Affordable Ypsi is working hard to stop this hazardous development. You can find them on Facebook HERE and on their new website HERE. *You can see the whole page whether you have a Twitter account or not. YN has to break the news. Twitter is a great format. Join us there. You can see the feed whether you have a Twitter account or not! FRIDAY AUGUST 7TH – First Fridays Ypsi was spectacular this month, bringing hundreds of revelers to the streets to celebrate our local arts and music scene! 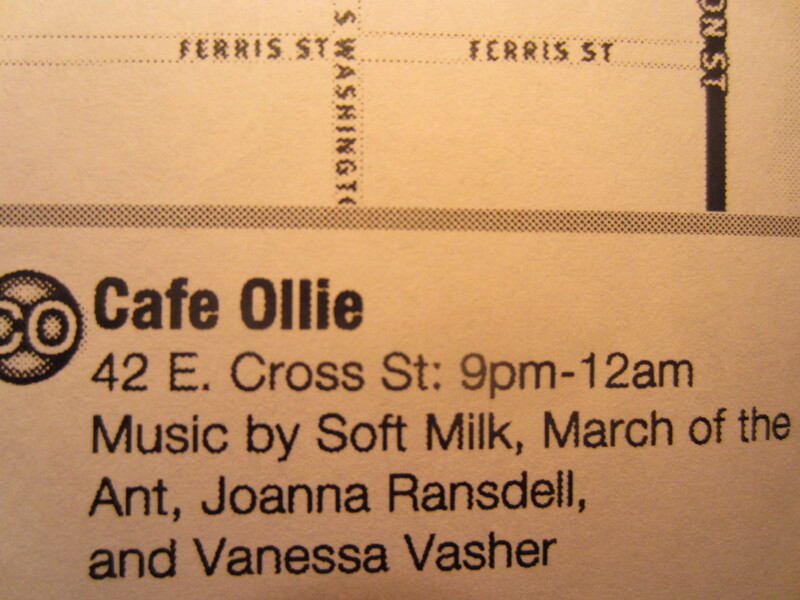 FREE art and music events happened at 16 local businesses, ending with new local sounds from SOFT MILK enrapturing our hearts at Cafe Ollie. FIRST FRIDAYS – If you don’t know about First Friday‘s yet, you must not be walking around town very often on the first fridays of every month. Since 2013, a new non-profit (#FirstFridaysYpsi) has organized a FREE art walk around town, so everyone can visit businesses that have art on display, live music, live art, and more, all within walking distance around town. Even Ypsilanti City Hall has participated with a display of art from a local school! Our only complaint is that there is so much going on, you can’t see everything you want to for as long as you want. First Friday, August 7th 2015, had hundreds of Ypsilantians walking around Downtown and Depot Town enjoying the artistic festivities. Hula hooping, music, and live portrait drawing made for a decent sized crowd on the sidewalk in front of 206 West Michigan Avenue in front of Lampshade, a new venue/meditation studio that has not opened yet (right next to Frank’s Drugs). You can see pictures at #FFY on Facebook if you search a little. Anthony Morgan on the mic in Library Plaza downtown gave us a mix of prose, philosophy, flows, and anthology. There were many familiar faces in the crowd and people were gettin down. The new 90’s store Friends Closet on the SE corner of Washington and Pearl had free painting if you had a canvas or bought one. Bona Sera featured art from the top three winners of the 2014 Heritage Fest Live Art Showdown. Many people remarked that the prices on the art were awesomely reasonable as well. With all of the live music and extra people all over town, several locals we talked to near Emmet and Ballard Streets still were not familiar with First Fridays. Make sure you tell your friends! Check out First Fridays online at http://firstfridaysypsi.com and https://www.facebook.com/FirstFridaysYpsi. To find out where its happening each month, visit their websites or look for these fliers at bulletin boards around town, like Ypsilanti Food Coop, Ugly Mug, etc. 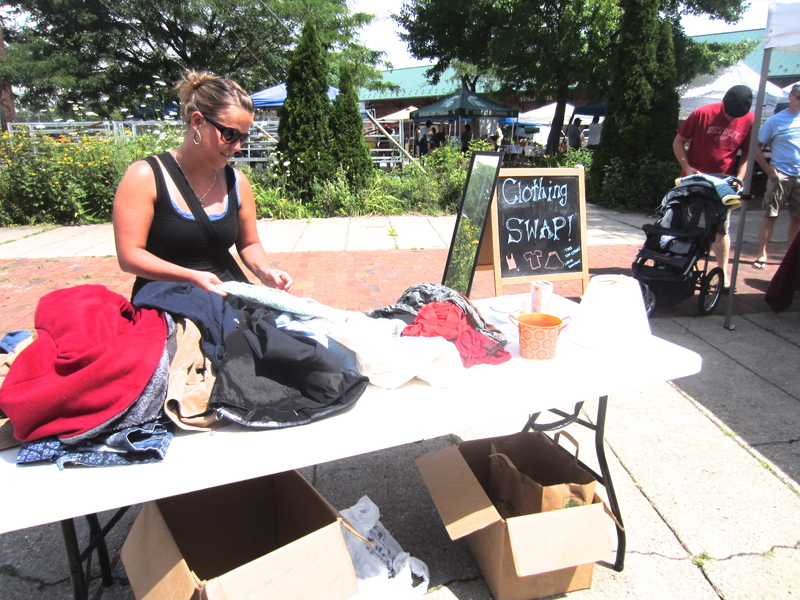 The FREE CLOTHING SWAP/SHARE happens EVERY SATURDAY IN DEPOT TOWN FROM 9AM TO 1PM! Bring stuff, take stuff, whatever you want… IT’S FREE! Come join the free fun. 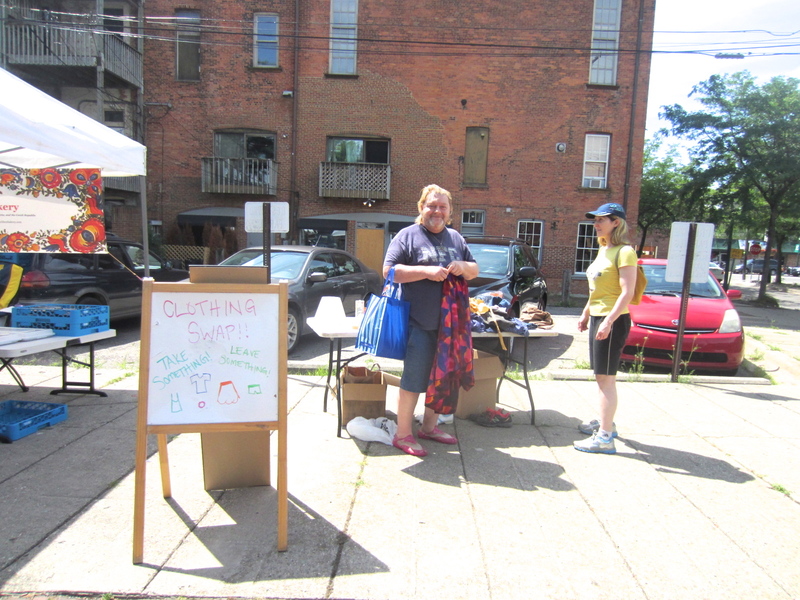 And get your super fresh produce from our local farmers when you get free clothes! They take cash, credit/debit, EBT and WIC. Double your food bucks with EBT!! MEANWHILE, DIY YPSI HAPPENED ALL WEEKEND AT CORNER BREWERY! Here is the link to the 3rd video from Freek Fest 3! We bring you the news because the news happens. 1. There has been a ‘rash’ of home invasions in Ypsilanti and Superior Townships. Read about the breaking and entering here: http://www.mlive.com/news/ann-arbor/index.ssf/2015/08/rash_of_home_invasions_reporte.html#incart_river This is not abnormal for our area, except the perpetrators don’t often Break to enter. Usually, they go into your car, house, or garage through unlocked doors. Ways to prevent this are: double-checking to make sure doors are locked, security systems, security signs, and other deterrents like dogs, motion sensor lights, motion sensor alarms (some make a dog-barking sound), making sure your place looks well lived-in and like many people are HOME and watching, and getting involved in your local neighborhood watch. 5. 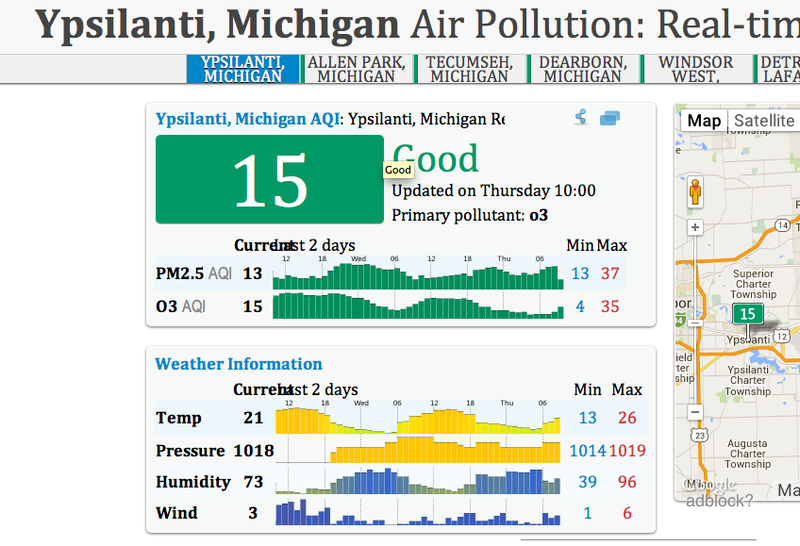 Our Air Quality has been GOOD lately! Can you smell it? Erich the Viking and Matt Nisbett are featured in this segment, as well as the crowd, the river, and the love.